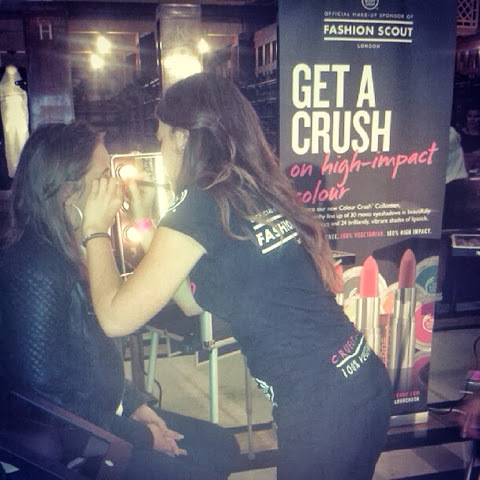 SS14 witnessed The Body Shop as the Official Make Up sponsor for Fashion Scout for the sixth season running. Being the make up sponsor is reeeeally cool for us because it means that our products are showcased at the majority of shows. The looks for each show were designed by Lan Nyugen-Grealis and if I do say so myself, she did a wonderful job! The UK PR department represents The Body Shop, so little me got to tag along. For five days I was privy to the glamorous world of fashion. 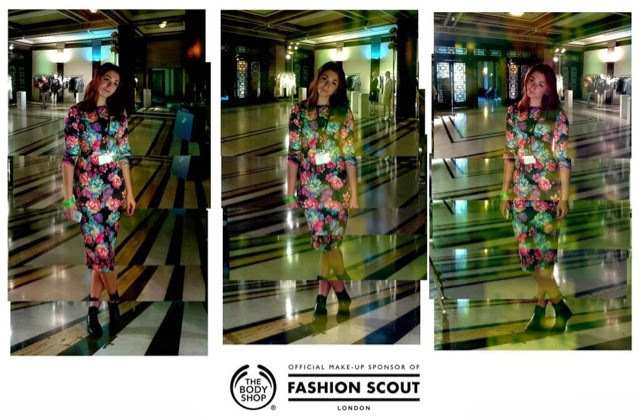 For those who don't know, Fashion Scout is a little different to London Fashion Week, the latter held at Somerset House. 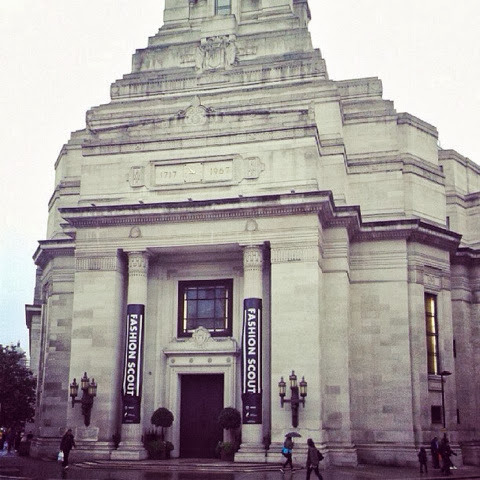 Fashion Scout (taking place at Freemason's Hall) runs alongside Fashion Week but showcases new fashion talent, in addition to the more zany designers who aren't as commercial as, say, Stella McCartney and Burberry. My duties were attending to on-going tasks in the quiet periods, not glamorous at all (and rather uncomfortable on bar stools and a hard wooden table). However, when people were milling round the exhibition space (where we were based), I had to make small talk, encourage people to have makeovers with our trusty make up artists (not really a hard sell) and persuade fashionistas to strike a pose in our one-of-kind magic mirror. Essentially, you had to tweet the mirror with the colour you were wearing... The mirror would receive the tweet, take a photo of you in three different mirrors (each with 5 cameras, creating a fragmented, artsy image) and tweet this back at you, along with a recommended shade of our new make up range. Preeeeeetty snazzy. 1. No matter how hard you try, you will always be out-fashioned. At home, I'd try and put an outfit together which was simultaneously work-friendly and pretty. However, within two minutes of walking into the building, I felt like a frump. I blame the lighting. 2. I'm nearly 5 foot 8, and I wear a size 8-10. Okay, more a size 10 nowadays. BUT WHATEVER. Fashion week is the only time you will feel A) short and B) regret every single cake/chocolate bar you have consumed that week. I thought pre-fashion week diets were a JOKE, but having seen the kind of people walking around, I realised it was anything but. I had to remind myself that I would only feel like this for 5 days, and also that the kind of people modelling and taking part ARE NOT YOUR AVERAGE PEOPLE. This is what I had to say to my sister when she remarked how long the models' legs were: "Oh, don't worry, models aren't real". Ahem. 3. Freebies are your best friend. 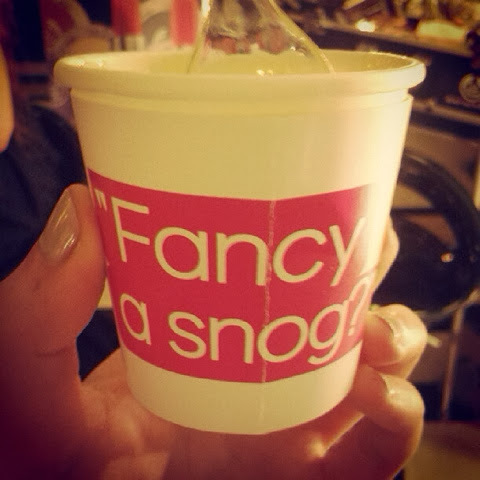 I don't know what I would have done without an hourly dose of frozen yoghurt, kindly provided by another fellow sponsor, SNOG. For those who haven't tried their yoghurt... Do it! It's unbelievable. Just thinking about it makes me nostalgic. 4. Working days are long; longer than a city working day. You need to find a way to counter the exhaustion. My solution was Patisserie Valerie Chai Lattes. Mmmmmm, chai. I also kept myself alert by celebrity-watching and making mental notes of what to look out for in the shops. Fashion week is prime people-watching time! And I love people-watching. 5. The upside to being out-fashioned is that you will also be out-weirded, but in a good way. There are some weird and wonderful aspects of Fashion week: the designs, the outfits, the people and the behaviour. Normal social and aesthetic etiquette are alien at Fashion Week, which is pretty liberating. It's everything I love about London, but MAGNIFIED. Below is Pandemonium, looking absolutely fabulous, complete with her dog, Snowy. 6. Some people chaff absolute BS. Some people are rude. But the good news is, since everyone is there for the sole reason of appreciating beautiful things, most people tend to be positive. And if you receive a compliment from a guest, it feels like the best compliment ever. 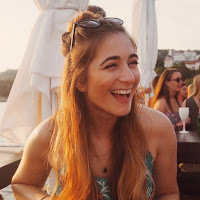 A blogger told me I had great eyebrows and for a millisecond I felt like Cara Delevigne and it made the whole experience worth it. 7. Working fashion week can make you pretty jaded by the whole experience. However, if you're not a blogger/VIP/photographer/anyone especially important (like me), try your best to get into one of the shows. They are absolutely amazing :) My favourite shows were Heohwan Simulation and Pinghe, both of which seemed to balance the masculine/feminine trend and were oh-so-chic, with wearable heels and incredible attention to detail. It reminds you what the whole week is really about: showcasing the newest and best fashion out there. So this pretty much sums up my experience of Fashion Week. My last piece of advice would be to remember to take care of yourself in the run up, the duration, and the follow up. You don't want to come down with the dreaded "Fashion Flu", because let's face it, snotty red noses and wheezy coughs are never on trend.